Kind to our users skin, great for older pupils. 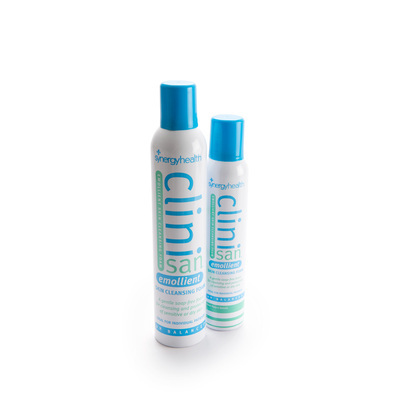 Ideal for use in patient care, this hospital-tested Clinisan Emollient Skin Cleansing Foam 400ml has been proven to leave skin lusciously moisturised while powerfully killing bacteria within a 2-minute time frame. Formulated for gentle care of sensitive skin, this spray on/wipe off mixture cleanses skin and dries quickly to leave a clean and hydrated finish. Lightly scented with a long-lasted deodorising fragrance, the easy to apply foam comes with a removable and washable nozzle to ensure optimal hygiene and is water repellent to prevent rewetting. The cleansing foam mixture has been created with no preservatives for a non-irriative result that is suitable on all parts of the body. Simply spray foam onto skin, wait 30 seconds and wipe off. Browse other Clinisan Products which we recommend are used together in your comprehensive cleansing routine to receive optimal results.